Agent 13 is an independent operative fighting the Brotherhood. Millenia ago the advanced civilization of Lemuria thrived and for centuries seemed unbeatable. Then barbarian hordes increased their thrusts into that empire's lands and gradually destroyed it. The few survivors managed to create a secret base where they were able to preserve their technology and their culture. Over the many centuries that saw the slow advance to these days, the hidden descendants of Lemuria watched and often manipulated the goings of the outside world. Many events throughout history that looked odd and unexplanable were the results of Lemurian intervention, all extremly covert. With the turn of the 20th century, the leadership of this group grew less inclined to stay in the shadows and more determined to resume their rightful place as rulers of the world. The primary leader, a person known as Itsu but also as the Hand Sinister, has molded the organization into a group calling itself the Brotherhood and dedicated to world dominations. In 1907, a very young boy, showing great signs of tremendous ability and potential, was kidnapped from his home and taken to the Brotherhood's headquarters, the Shrine. There he was given the designation of Agent 13 and trained to become one of the elite operatives for the Brotherhood, a man skilled in assassination and able to handle all manners of covert missions. His ability to learn and improve on his training was incredible and before long he was their best agent. Being as good as he was, though, it was almost inevitable that this man capable of learning all sorts of secret information would learn of the Brotherhood's real plans of taking control of all government and subjugating the people. He rebeled and was thus branded a traitor and marked for death. He did not go easily into the final sleep, though, and he mounted his own war against his former teachers. He quickly showed them that they had taught him well. He put together his own small but effective team as dedicated to bringing down the Brotherhood as he was and with his new friends, his ability to harass the Brotherhood became legendary, making him their greatest enemy. As the Brotherhood makes itself known to world leaders as a round of extortion begins, Agent 13 makes his war with the Brotherhood known to them. Captured by the Brotherhood, Agent 13 is brainwashed and convinced he is one of the Serpentine Assassins and his next mission is to hunt down and eliminate his old friend, Maggie Darr. With his friend, Maggie Darr, held captive by the Brotherhood and their leader ready to become immortal, Agent 13 knows he has no choice but to infiltrate their headquarters. 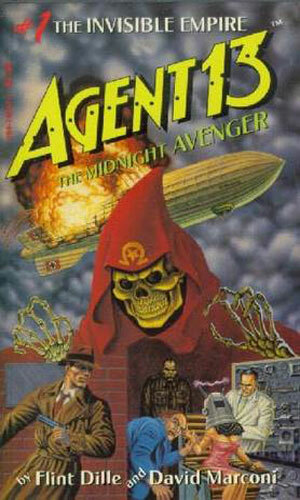 A graphic novel depicting the first mission by Agent 13 against the evil Brotherhood. 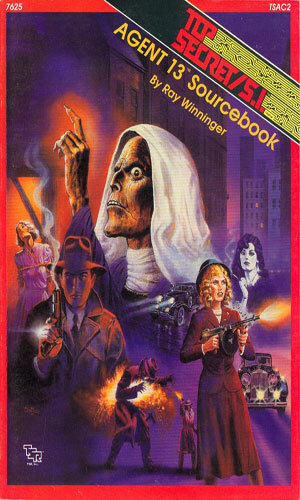 A graphic novel. The Brotherhood's plans for taking over the world are close to coming true and it is up the Agent 13 to stop them. Players of TSR's Top Secret/S.I. 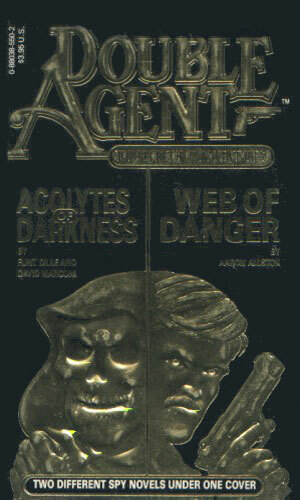 role playing game were able to enter the world of Agent 13 through the instructions and adventure setups presented in this book. 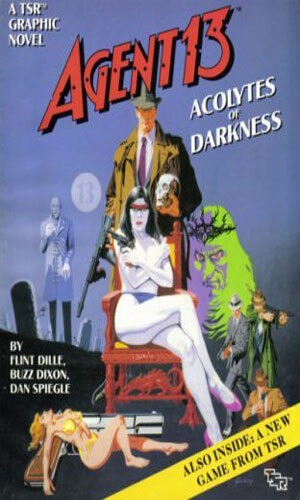 Though created in the late '80s, the adventures of Agent 13 are a distinct and pretty impressive return to the wonderful days of the pulp era. The two authors, both experienced in story telling, shared a love of the old style adventures and on a whim put together the idea for Agent 13 and his war against the Brotherhood. According to one version I read, they convince Gary Gygax, co-creator of Dungeons and Dragons and then president of TSR, to publish the books they would write about this operative. Rules for playing in the world of Agent 13 in the role playing game Top Secret were created. 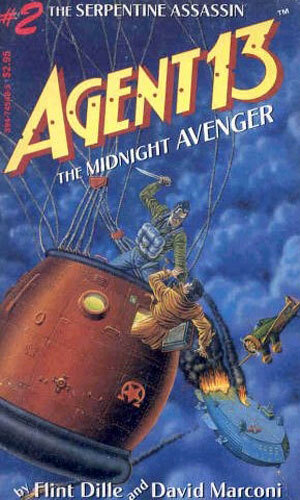 Two graphic novels depicting the fight of Agent 13 and his friends were published. 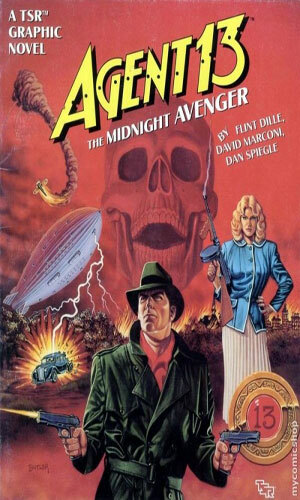 Then the world of Agent 13, the Midnight Avenger, fell into fair obscurity, which is a shame because I really liked the books (I was a gigantic Shadow and Doc Savage fan so anything pulpish had a leg-up with me). A couple years ago, the graphic novels were re-released as were ebook versions of the books. There was even talk of a movie. Whether anything will come of that is at this time unknown. I would hope so. I would like more Agent 13. I really would like more of Maggie Darr (you need to read the books to see why).